The series decider turned out to be a thriller, with India almost chasing down a mammoth target. India finally managed to lose a series in their tour towards the Pacific as they bowed down 2-1 to New Zealand in the T20I series. Apart from the first game, the series was hard-fought and had all ingredients of a blockbuster. Fans were whiplashed with some amazing strokeplay and as they metaphorically say, cricket was the biggest winner. The first game was a disaster for the visiting side, who failed miserably in all aspects. After conceding 218 runs bowling first, India got bowled out for 139 runs and got off to a poor start. However, Rohit Sharma’s fifty and Krunal Pandya’s incredible spell helped them win the second game at the Eden Park. The decider turned out to be a thriller, with India almost chasing down a mammoth target. Yet, some poor decision making and horrendous fielding effort from India let them down and handed the hosts a 4-run win. With the series coming to a close, let’s take a look at the best-combined XI of the T20Is. The 24-year-old from Wanganui was pretty authoritative with his hitting and barely had second thoughts while striking the ball, making him the best possible winner of the Player of the Series. He had the best strike-rate (among the batsmen with over 50 runs) and also finished with most runs (139 runs). Selectors might as well monitor him closely before they pen down their final 15 for the World Cup. When he gets going, very few batsmen can strike the ball as cleanly as Colin Munro. He had some lives in the 40-ball 72 in Hamilton, but some of his big hits left the crowd awestruck. His knock in the final T20I earned him the Player of the Match and gave his side the little edge with which they eventually pipped the Indians. Captain marvel Kane Williamson was pretty brilliant with the way he led his side and wasn’t bad with the willow in hand. He got starts in all the games, but failed to make anything big out of it. The way he came out and blasted three sixes in the first game was reminiscent of his exploits with the Sunrisers Hyderabad in IPL 2018. A fantastic outing for Tamil Nadu all-rounder Vijay Shankar, who seems desperate to prove he’s not the cricketer the world saw in the Nidahas Trophy final last year. Apart from a decent 43-run knock in the final T20I, he got off to a good start in the first game and looks very promising to end up in the 15-man World Cup squad. 4,6,6 – Rishabh Pant did this off his first three balls when he came out to bat in Hamilton. This is what he promises to deliver and barely gives second thoughts when he’s coming in. He failed in the first game, but did a pretty good job in the other two and is an automatic selection in the team. Ball striking with brute power has been one of the most attractive features of this series and Colin de Grandhomme has been arguably the best exponent of that art. He scored a much-needed fifty in the second T20I to push the hosts over 150 and followed it up with a 16-ball 30 in the decider. It was a very decent outing for the Zimbabwe-born 32-year-old. His spell in the second game was nothing short of outstanding and deservedly was named the Player of the Match. He had a horrible outing with the ball in the decider but chipped in with a decent knock in the death. Krunal will be a great prospect for the side in the times to come. Not often we see a non-Asian spinner dictating terms to Indian batsmen, but Mitchell Santner with his canny deliveries troubled most of them. 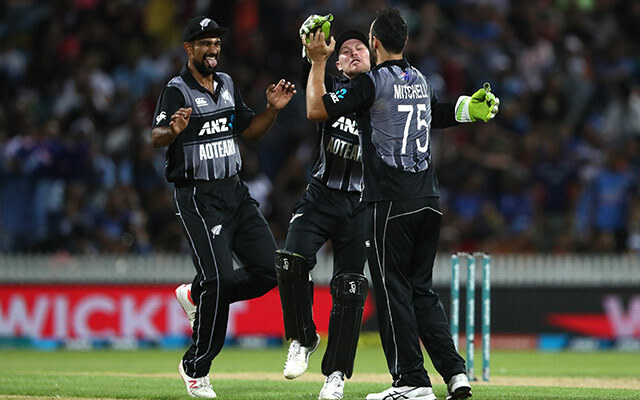 The left-armer picked up two crucial wickets of Dhawan and Vijay Shankar in the final game to go with his outstanding 2/24 effort in Wellington. He bowled just two overs in the second game and went wicketless. Khaleel Ahmed was not right up there with his pace, but who needs it when you can pick up big wickets at regular intervals. It’s difficult to bowl in the death overs especially on lifeless tracks like these, but he did a decent job overall. He picked up four wickets in three games at an economy of 10.17. Tim Southee brought all his experience into play in the final over against Dinesh Karthik and won the duel convincingly. In a series where bowlers were being tonked for over 10 an over, he maintained an economy of 8.17, which reiterates the class act he is. A pretty decent outing for the 30-year-old who is hungry for his team to go one step ahead of their previous World Cup performance. With a run up of barely 25-30 feet, Lockie Ferguson hits the deck hard at over 140 kph consistently and posed a difficult challenge for the Indian batsmen. Arguably the best bowler of this series, Ferguson returned with three wickets in two games at a mind-boggling economy of 6.62.